CSA - what is it? CSA - what's in a share? Posted 1/8/2018 10:06am by Joshua Reinitz. 2018 will be our 10th year growing vegetables, and we have spent much time in the past few months thinking about how we want to structure our farm enterprises, grow our business, and be as successful as we can be. I must admit 2017 was a difficult year for us, and some fundamental issues with our farm came to light. It has taught us a very good lesson about looking to our values and land first in regards to how to proceed, rather than looking to some idealized model of CSA farming that already exists. 5 years ago, we had our third child, Sam. He is a bundle of joy, full of energy, and will be starting Kindergarten this fall. When he was born, we were successfully growing on about 5 acres of land, had over 100 CSA members, and thought we could maintain that level of vegetable growing. Since we didn't have much time for annual planning and analysis, we have been maintaining the same land level, same seed order, same planting schedule. We thought we could maintain what we had been doing with a newborn, by hiring some part-time help. Putting a farm on auto-pilot for a few years is not a recipe for success as every season is completely different, and raising a newborn-toddler child takes most of our focus during the day. Even with hired help, we have been operating at a level beyond our abilities - leading to weedier fields and some failed crops. We prioritized keeping our CSA boxes nice, which I think we've done, but have not done as well maintaining our sales and growth to grocery stores and restaurants. I may be sounding hard on myself, but after 5 years of operating at 2012 levels with three kids, we have decided to shift our farm focus a bit. We are reducing the number of acres we grow in vegetables from 5 to 2, which will allow us to grow in a more intensive and focused way, leading to higher success and better managed crops. This means fewer CSA memberships available this year, but we are OK with that as we will be less stressed and will have a greater sense of pride and joy in what we do. Another part of our 10-year farming business analysis has led us to realize we want to grow towards a restoration agriculture/permaculture model for our land. In short, rather than imposing a farming system like row-crop vegetables on to our land, we look at what our land is already growing and enhance those things. It's more of a whole-land use model that restores the natural landscape while providing food for people and nature. For example, our land grows wild fruits like plums, apples, raspberries, currants, and grapes very well. These wild fruits do not yield the same as varieties developed for people, so why aren't we loading our land with varieties of fruit that are high-yielding - we maintain the natural landscape and native plant community while providing more food for people than what currently exists? It's a subtle shift in thinking that places the needs of the land first, with the expectation that if we take care of the land, it will provide. The word "permaculture" means perennial or permanent agriculture. Other examples of how we can use our land in a perennial way include wild-foraged crops, mushroom cultivation, maple syrup, lumber/firewood, fruits and nuts, and pastured land for livestock. All of these things come out of a landscape that never has to be plowed, and in fact all of them can happen simultaneously on the same acreage. Think cattle or pigs grazing underneath chestnut and apple trees, harvesting wild herbs for tea and medicine under a canopy of sugar maples, and so on. A fully-integrated system that benefits wild lands and animals, while providing food for people. We will maintain some land in annual production - a couple of acres of land for vegetables, and about 5 acres for grains to feed our livestock (in 2018 we are growing oats and wheat, some of which may be milled into flour). We are trying to close our farming system so no outside fertilizer or other inputs are needed. Our hay, grain, and pasture feeds livestock, whose waste is used to fertilize our vegetable fields. The waste from the vegetable fields is fed back to the livestock or is composted. Every step of the process feeds people, animals, and the soil. Amazing! So, that's where we are at - a new year, new beginnings for the farm, and a fresh outlook on life. Our little Sam is now 5 years old and is much less work than he was a few years ago. Rather than going in to change diapers and feed him and attend to his needs every few minutes, he is now able to play outside independently or help us harvest veggies while we work. The past 5 years have been a blur, and we really appreciate all the CSA members and farm customers who have helped us make it all possible. Our next 5 years will be a chance to grow in a new directions, hone our vegetable farming skills, have well-managed beautiful fields of produce, and spend more time cooking and preserving what our amazing land gives us. 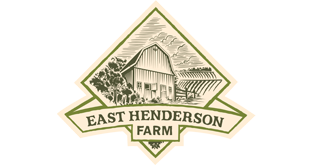 our 2018 CSA sign-up page is now live, so please go to http://www.easthendersonfarm.com/members/types to sign up. We have introduced a sliding-scale fee this year for our CSA, as we want the shares to be more accessible to folks in our community. On our signup page you will see a price range, and anything you can pay in that range is good. All content property of East Henderson Farm.